Henry Ford was an American industrialist who is famous for founding the Ford Motor Company and developing the mass production assembly line. He lived during the 19th and 20th centuries and is responsible for bringing affordable cars to everyday American households who previously couldn’t afford to buy one. 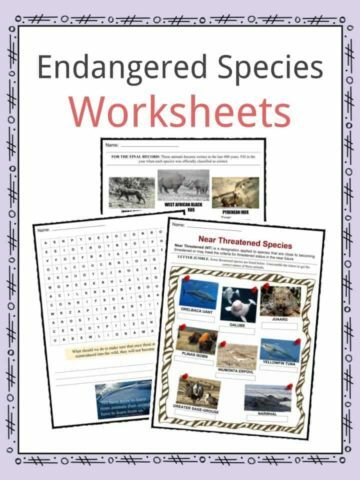 See the fact file below for more information on Henry Ford or download the comprehensive worksheet pack which can be utilised within the classroom or home environment. • Henry Ford was born on July 30th, 1863, in Michigan, USA. 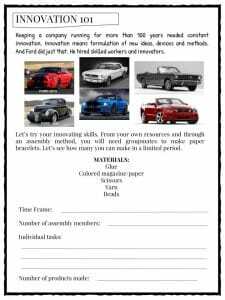 • Ford is often wrongly attributed as being the first person to invent both the car and the assembly line. Ford did not invent the car or the assembly line, but he developed both so that they could be used efficiently by modern America. • Henry Ford was born on a farm in Michigan. He had 4 siblings. 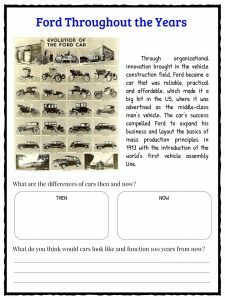 • As a child, Ford had a strong interest in engineering and would take things apart to see how they worked. • In 1879, Ford left the family farm and went to train as an apprentice machinist in Detroit. This led to a job servicing steam engines. • Henry Ford married Clara Jane Bryant in 1888. They had one child: a son, Edsel. • To support his wife and family, Ford ran a sawmill. • In 1891, Ford became an engineer for the Edison Illuminating Company. He later met Thomas Edison himself, who encouraged Ford to study automobile engines and build vehicles. • In 1896, Ford created the ‘Ford Quadricycle’ – his first self-propelled vehicle. • In 1898, Ford had built a second vehicle, thanks to Edison’s support and the sale of the Quadricycle. 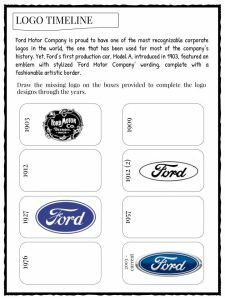 • Ford founded the Detroit Automobile Company in 1899 to build his new vehicles but the business was unsuccessful and closed in 1901. • The Ford Motor Company was created on June 16th, 1903, by Henry Ford and his acquaintance, Alexander Malcomson. • In 1903, Ford broke the land speed record when he demonstrated his new car on the ice at Lake St. Clair. He drove 1 mile in 39.4 seconds. The car was named the ‘999’ and was toured around the USA by race driver, Barney Oldfield. Ford soon became a household name. • In 1908, the famous Ford Model T was introduced. It was one of the first cars to have left-hand steering. • All Ford Model T cars were painted black. • The Model T was also known as the ‘Tin Lizzie’. • The Model T was successful because it was easy to drive and cheap to repair. • Ford developed the first moving assembly line in 1913. It revolutionized the way that his cars were manufactured and productivity soared. The assembly line meant that the car would move from one workstation to the next, with each worker having a dedicated role. • By 1914, Ford had sold over 250,000 Model T cars. In 1916, he reduced the price of the car to $360 (about $8000 in today’s money). • By 1918, half of all cars in America were Ford Model Ts. • Between 1901 and 1913, Ford used to enter Model T cars into races across the United States. • In 1918, Henry Ford passed over the presidency of the Ford Motor Company to his son, Edsel. • In 1926, sales of the Model T had started to drop as other car companies began to produce cheap cars. Ford responded by creating the Model A – a car that could be bought on finance. • Ford’s son, Edsel, died of cancer in 1943 and Henry was forced to take back the presidency of his company, despite being old and frail. • Henry Ford died on April 7th, 1947, at the age of 83. • Henry Ford is known as being a ‘pioneer of welfare’. His employees all earned $5 per hour and only worked 5 days a week. • Ford was also known to be a Freemason. 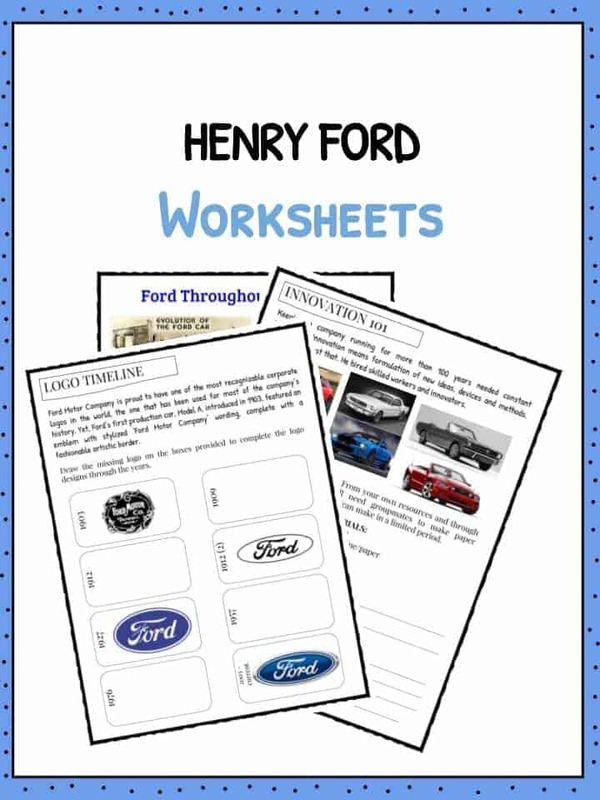 This bundle includes 14 ready-to-use Henry Ford worksheets that are perfect for students to learn about Henry Ford who was an American industrialist famous for founding the Ford Motor Company and developing the mass production assembly line.